Kimi ga Suki is a short and sweet Shoujo, Sports, Romance manga that follows the general consensus; of not being much about the sport and more about whatever love polygon it chooses as its main focus. And that is on Aki Murakami, a teenage girl who enjoys basketball and is in the same club as her long time friend and secret love Mase. With this being a short manga, I was glad with how the mangaka managed to tell us all what the reader needs to know in the 1st couple pages, without resorting to blatant exposition. This allows the story to move at a brisk enough pace to really get things rolling, as it soon introduces Aki's secret admirer Koichi and from then on it's a story full of tension and unease. Okay first let me get this out of the way... the story is nothing but a big old love triangle(square) and it's one of those that I particularly don't like. And yet, surprisingly I enjoyed reading this manga and it kept me engaged enough to finish it in 1 night. Yet since the manga is short enough to finish in a single night, means the characters just weren't as fleshed out as they could have been. This is a shame because I really like the main 4 characters, minus some of the frustrating decisions they made. So much more could have been done with them, like with poor neglected Natsumi, since I felt like they had the potential to be a truly noteworthy bunch. With that said, the art style here is plain old generic shoujo, which isn't saying that it's bad. It is just something I've grown use to it from reading countless shoujo manga (from the plain yet attractive looking characters to the cute lil patterns between panels) and that's the problem, because Ayu Watanabe does nothing to distinguish her style from all the other generic looking shoujo I've come across. So whereas I can look at anything by Ai Yazawa and immediately tell it's hers, Kimi ga Suki looks just like any other shoujo manga and whether that's a good or bad thing is up to you. 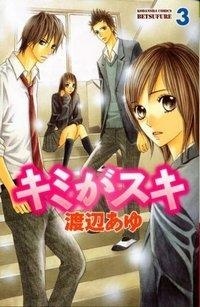 So in the end Kimi ga Suki is a good shoujo manga, for what it is, but there's nothing remarkable about it. The story was interesting yet predictable, the characters were appealing yet under-developed and the artwork's just more of the same you've seen in most shoujo material. So feel free to check it out, if you're looking for something that's short and sweet, but don't expect anything truly breathtaking. I thought this story was great. Sure it was predictable at times but still very sweet. Character development was great in this manga, you get to see firsthand the emotional effect decisions have on you when you are stuck between what you want and what you think is right. I loved Aki's character, she was strong, and I like to believe she did what anyone would do in her situations. All the characters had a human feel to them, It had a lot to do with the way the coped with things and also their reactions to life's events. The art was nice and there were no inconsistencies that I noticed. It was clean and flowed well with the story. Life is painful but I think this manga helps us realize that our decisions, no matter how insignificant we might think they are have a way of altering our lives and the lives of those we love.